Informative talk by James Nixon. Informative talk by Cathy Hinds, N. Ireland officer for IWDG. Meet at Portaferry Quay at 2pm for an entertaining and informative 2-hour voyage travelling on the St. Brendan while exploring the beauties of Strangford Lough. The aim is to be back by 4pm. Bring warm clothes and a snack. Boarding is by steps down from the quay and over the side of the boat. Admission: £10 (proceeds in aid of PAST). Informative talk presented by Robin Ruddock. Robin is well known for his maritime exploits and his ability to communicate. This will be a fascinating evening during which he will cover sea kayaking, currachs, whales and dolphins, beach-combing, Drontheims, the Colmcille, the Wild Goose and "The Quest For The Selkie". Informative talk presented by Joe Breen, Senior Scientific Officer, Marine Conservation and Reporting, Marine & Fisheries Division. Strangford Lough is an inland fully saline sea connected to the Irish Sea through a long narrow channel often referred to by locals as ‘the river’. Within the body of the lough the current speeds drop off the further north you go and the current speeds are directly correlated to the nature and structure of the underlying seabed. The South North gradient runs from bedrock-boulder-cobbles-gravels-sands-muds. The nature of the seabed and water flows dictates what type of marine life are to be found in any particular region of the lough. This presentation will show the range and diversity of animal and plant forms to be found in the lough. The unique collection of biodiversity forms was the main reason for designating Strangford Lough as Britain’s first Marine Protected area in 1995. Start Time & Location to be confirmed. 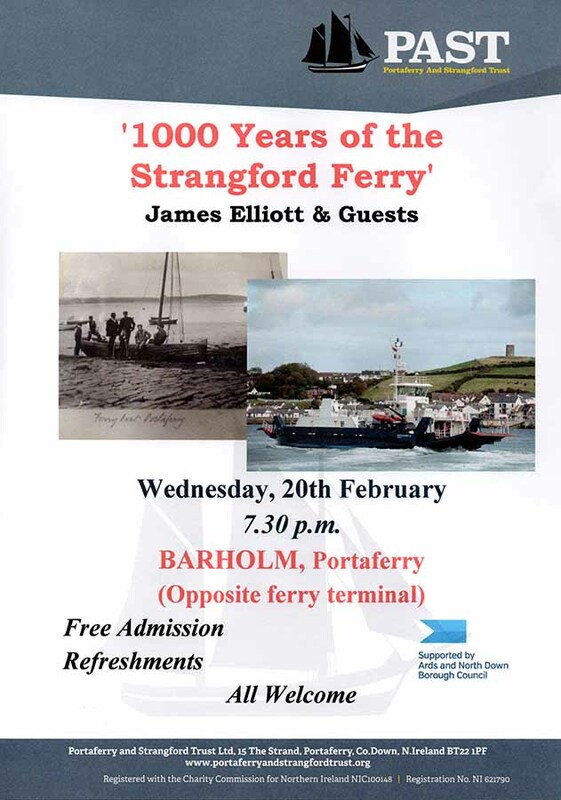 Major community event - 5th annual "Carol Ship on Strangford Lough"
Allison Murphy and Friends - dramatised presentation of excerpts from the Jim Blaney Archive. PAST were very fortunate to be given the extensive archive of Jim Blaney following his death on 31 December 2014. It is currently stored in 120 containers ranging from box files to large storage boxes and is being catalogued. 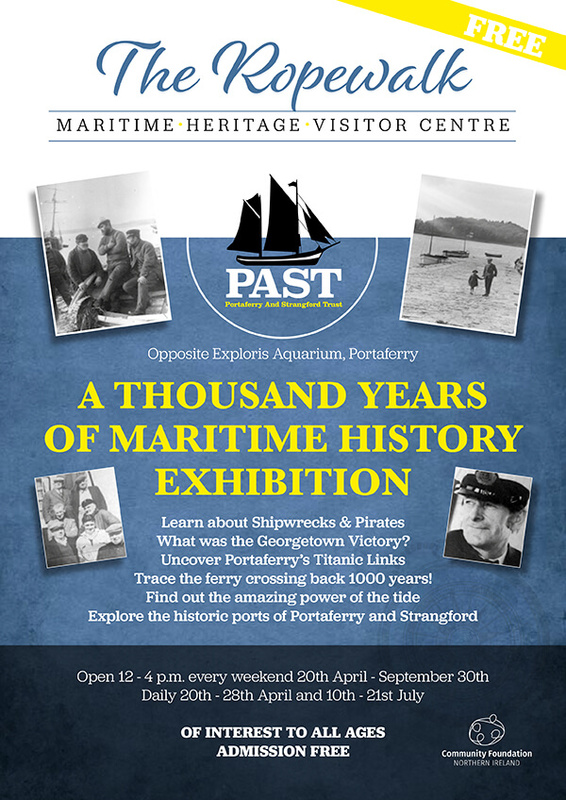 The topic areas are mainly maritime (shipwrecks, lightvessels, local seamen and their families, miscellaneous maritime episodes usually with a Portaferry connection) but also cover local history, Lurgan history and various aspects of Irish culture (language, music, folklore, religion). It includes numerous notebooks, copies of documents and newspaper articles, original correspondence, photographs and 35mm photographic slides, a small number of artefacts as well as approximately 800 published books. There are many treasures in it. Allison, who has a teaching background and is a co-founder of the Belfast Titanic Society is a remarkable communicator. She has appeared on radio and television, presented regularly on a wide range of topics to a variety of audiences, written the text for major visitor exhibition in Belfast City Hall charting the City's history and written a number of well-received books.